On the night of the pop up party we revealed our location to the guests by “sharing our location” via text message. The plan was to have our guests meet us at a spot around Lake Merritt. Once everyone was at the meeting point our guests hopped on their bikes and rode around the lake in “Hunt” of the dinner party. It was a beautiful fall night in Oakland and a perfect evening for riding bikes together. 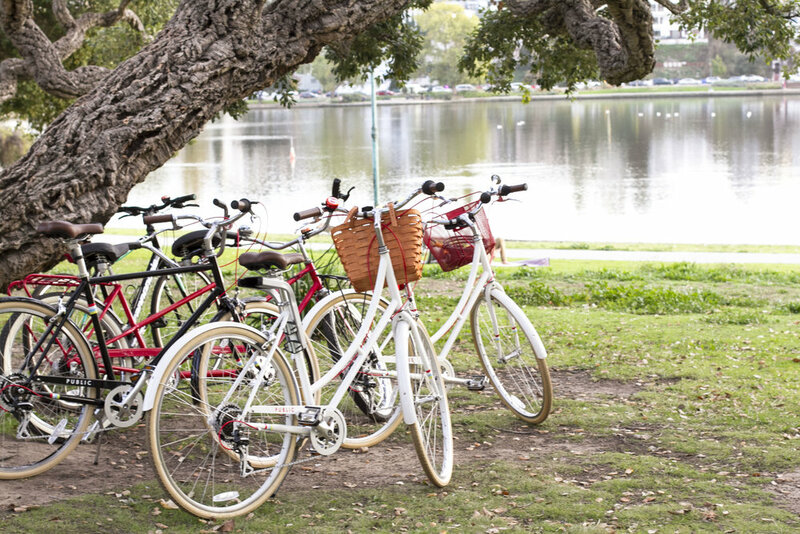 Once the party was found, the guests sat down to a beautiful rustic table full of charcuterie and more while the bikes rested up against a typical Oaklandish tree. It was picture perfect. As the evening progressed and the sun began to set, the edge of the lake was lit up with string lights and the table was glowing with candle lights. The conversation with close friends was as perfect as the setting. The evening stayed warm and cozy with flannel blankets, hot tomato soup and warm apple cider. After several hours of delicious food, strengthening friendships, and good conversation the evening finally came to a dreamy end.